1 Preheat oven to 375°F Spray large baking pan with Pam. 2 Put all the ingredients into a large bowl. 3 Season generously with sea salt and black pepper. 4 Make sure your hands are very clean and toss to distribute. 5 The garlic will drop into the water/oil solution but its flavour will permeate the potatoes, and this way, it won't burn. 6 Bake for 40 minutes. 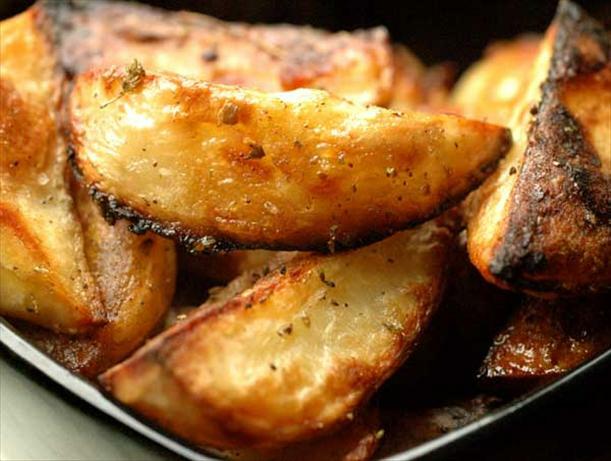 7 When a nice golden-brown crust has formed on the potatoes, give them a stir to bring the white underside up, season lightly with a bit more sea salt and pepper and just a light sprinkling of oregano. 8 Add 1/2 cup more water if pan appears to be getting dry, and pop back into oven to brown other side of potatoes. 9 This will take about another 40 minutes. 10 Do not be afraid of overcooking the potatoes- they will be delicious. 11 Note: I often melt a bouillon cube in the water; if you do, make sure to cut back some on the salt.